Give Up 300,000 Federal Workers… and then we’ll talk. The United States federal government shutdown of 1995 and 1996 was the result of conflicts between Democratic President Bill Clinton and the Republican Congress over funding for Medicare, education, the environment, and public health in the 1996 federal budget. The government shut down after Clinton vetoed the spending bill the Republican Party-controlled Congress sent him. The federal government of the United States put non-essential government workers on furlough and suspended non-essential services from November 14 through November 19, 1995 and from December 16, 1995 to January 6, 1996, for a total of 28 days. The major players were President Clinton and Speaker of the U.S. House of Representatives Newt Gingrich. 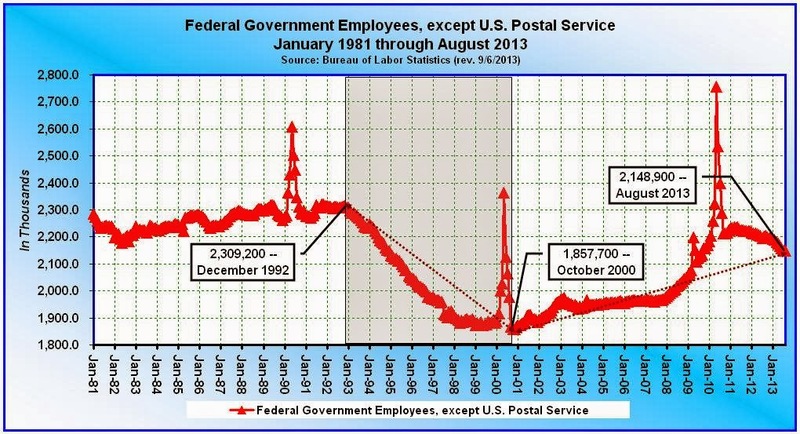 According to the U.S. Bureau of Labor Statistics, in November of 1995, near the beginning of the shutdown, there were 2,152,900 federal government employees, excluding postal workers. 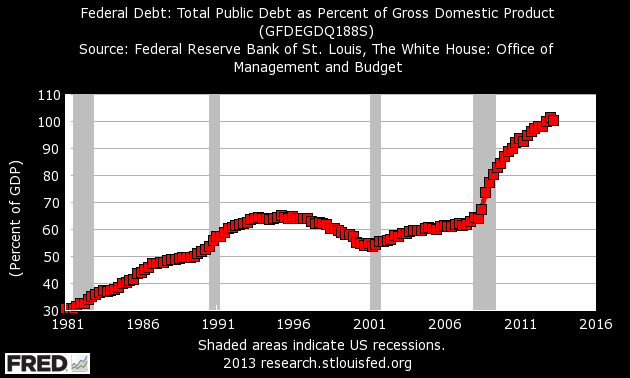 By January 1996, at the end of the shutdown, this number had been trimmed by 110,300, to 2,042,600. After the parties reached an agreement, the number of federal workers was further slashed, by an additional 184,900, falling to it’s lowest point in more than 30 years, all the way to 1,857,700 by October of 2000 (see chart below). Looking back a bit farther, there were 2,309,200 federal employees in December of 1992, so the number had already been slashed by 254,600 from the time Bill Clinton entered office until the shutdown. All in all, the federal government was able to rid itself of 451,500 non-essential employees between the years 1993 and 2000. Simply amazing! Unfortunately, since October of 2000, the number of federal employees has grown by 291,200, reaching 2,148,900 by August of 2013. How quickly we forget. But the situation today is even more dire. According to the Cato Institute, “Total wages and benefits paid to executive branch civilians will be about $248 billion in 2013, indicating that compensation is a major federal expense that can be trimmed. 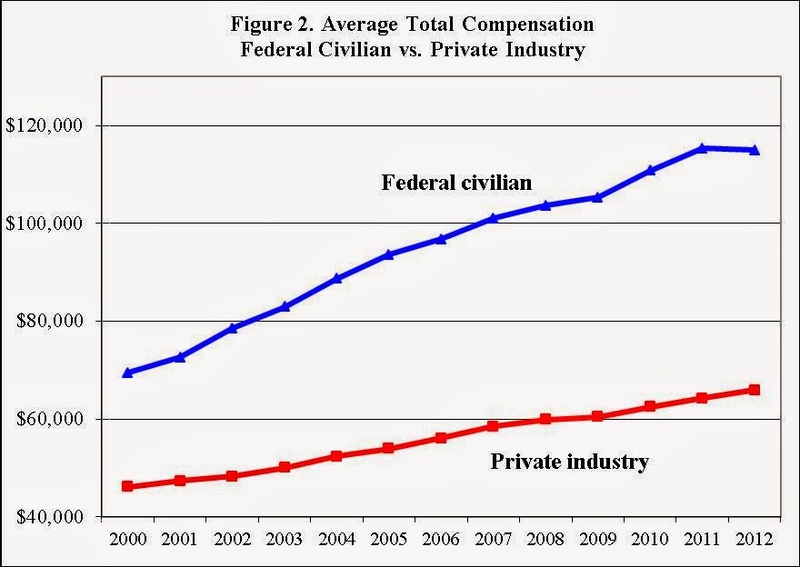 During the last decade, compensation of federal employees rose faster than compensation of private-sector employees. As a consequence, the average federal civilian worker now earns 74 percent more in wages and benefits than the average worker in the U.S. private sector.” What’s up with that? Keeping in mind that the only time the federal budget has balanced in our lifetimes was between the years 1996 and 2000, and putting aside partisan B.S. for a moment, what does that tell you? Was it just a coincidence that balancing the federal budget during this time-frame entailed slashing the number of federal workers to the lowest level in more than three decades? No it wasn’t. The Bottom Line: What this should tell us is that among the 900,000 (or so) non-essential federal workers just placed on furlough, at least 300,000 need to be sent packing – permanently. There’s no way the federal budget will ever balance again, until the federal government takes serious measures to reduce its own size. The private sector is not the problem; government is the problem. Now is not the time to add new entitlement programs, and ever more federal employees, rather like 1995 it’s time to slash and burn. Give up 300,000 federal workers, then, and only then, may we engage in an adult conversation regarding the remainder of the federal budget.